Caramel Bread Pudding smelled 100% freaking YUM! A scent you’ll want to practically eat. A good sign we have a winning bakery scent here. First sniff, the wax smelled exactly like the scent name… Caramel Bread Pudding. I only purchased a few to review and now I’m kicking myself I didn’t get more. Caramel Bread Pudding fragrance is made with a rich decadent caramel drizzled over homemade bread and warm butter. Vanilla pudding is blended into the batter. 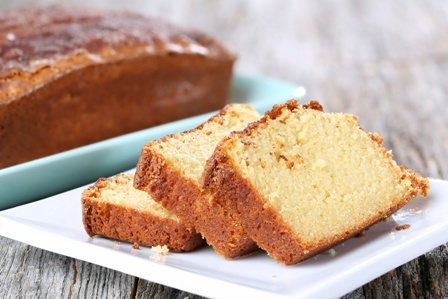 The fresh-baked bread is topped off with grated nutmeg, sweet cinnamon and a hint of dark vanilla essence then sprinkled with brown sugar. Okay, is your mouth watering after reading that description? Mine is!! Loved! Now let’s get to melting! I used the entire clamshell pack (3 cubes each) in two electric melters in my great room. I know that sounds like overkill but my great room is huge and two electric melters work best to scent that size room. Once melting… Mmm! And I seriously mean, Mmmm!! The warmest baked vanilla bread filled the upper level of my home. I didn’t smell a whole lot of caramel once the wax was hot. All I could smell was a warm vanilla bakery and let me tell you… it was mouthwatering. 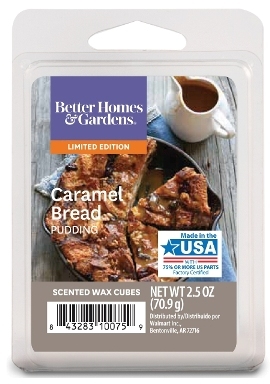 The name for this scent was perfect only I would tweak it a little and change it to – Vanilla Bread Pudding, not caramel. Super yummy! If you love bakery scents, I highly recommend this one. Strength – I would rate Caramel Bread Pudding an 8 out of 10 in a really large room. 10 in medium to smaller rooms.